When and where, after such forays, did I or could I write? Time meant nothing to me. I might be in the middle of some flu epidemic, the phone ringing day and night, madly, not a moment free. that made no difference. If the fit was on me–if something Stieglitz or Kenneth had said was burning inside me, having bred there overnight demanding outlet–I would be like a woman at term; no matter what else was up, that demand had to be met. Five minutes, ten minutes, can always be found. I had my typewriter in my office desk. All I needed to do was to pull up the leaf to which it was fastened and I was ready to go. I worked at top speed. If a patient came in at the door while I was in the middle of a sentence, bang would go the machine—I was a physician. When the patient left, up would come the machine. My head developed a technique: something growing inside me demanded reaping. It had to be attended to. Finally, after eleven at night, when the last patient had been put to bed, I could always find the time to bang out ten or twelve pages. In fact, I couldn’t rest until I had freed my mind from the obsessions which had been tormenting me all day. Cleansed of that torment, having scribbled, I could rest. As I record these thoughts during the midnight hour, I finally get down to something that has been on my mind since I awoke at 6:00 this morning. Only now have I had this moment at the computer. High school and college both needed many hours of attention from me today, as did an upcoming art festival. Having finished working on my inventory only a few moments ago, I nevertheless needed to address this strong connection I feel with William Carlos Williams and his compulsion to write even though he remained a very busy physician during all those years he wrote his poetry. He did his professional duty, yet he lived to write. Last night I faced some serious deadlines and had to complete stacks of grading while I volunteered my time at the Trinity Arts Guild gallery. 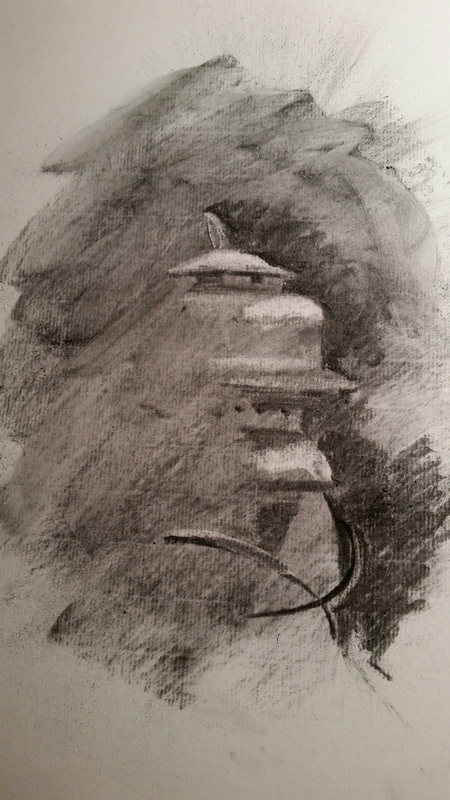 With only ten minutes to spare, I scratched out the erased charcoal rendering of the lantern above. I managed to find a spotlight on the premises, turned out all the house lights, and spent ten minutes focusing on part of the old lantern I had placed on the table before me. Today, as I moved through classes, completed educational chores and spent time on two campuses, all I could think of was this recent charcoal erasure experience and where it could lead, when only I could stop long enough to play with it. Throughout my life, like William Carlos Williams, I have not known leisure, really. I have always worked more than one job, or worked a job while pursuing a degree in college and later graduate school. Even now, in my later years, I find myself continually on the move, continually meeting deadlines, yet what matters most are those sacred stolen moments for creating ideas, scribbling words on paper, or making a work of art. And those are indeed sacred moments, the real spice of my life. Though I now feel exhausted to the bone, I cannot look back on this busy day with negativity. In my mind I remained free to think on what I wanted to think, and I cannot wait until the moment when I can pick up the charcoal and experiment further. That time will come, and I will be ready. Thank you, Dr. Williams, for writing a splendid autobiography, and encouraging one such as I to believe. And thanks all of you for reading. Nothing great was every achieved without enthusiasm. Dare to strike out and find new ground. I am trembling as I write this. Tonight I did my volunteer “gallery sitting” at the Trinity Arts Guild gallery at the Bedford Boys Ranch, as is my custom on most Wednesday nights. It’s always quiet here, and I hate it when I spend the entire time grading papers. Tonight I brought some still life objects from my man cave and some charcoal drawing supplies. I spent nearly ninety minutes working on stuff for my A. P. Art History class tomorrow. But all the while, I had this itch that would not go away. 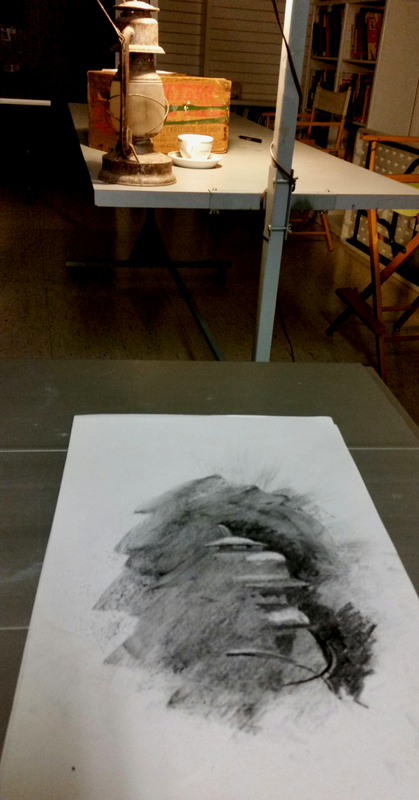 I kept thinking about my afternoon experience of doing charcoal erasure for the first time in my life, and remembered my workshop participants over this past weekend discussing how their art always turned a corner when they got out of their comfort zone. So, pushing my textbook and laptop aside, I trained a spotlight on this old lantern, sat down with charcoals and paper, and began. After ten minutes I just had to stop. The experience was too wonderful to describe. Like this afternoon, I covered my subject area with smears of rich charcoal, then got out a kneaded eraser and began drawing the highlights of the lantern, beginning at the top and stopping before I finished the globe. As I continually watched with amazement the lighted surfaces of the lantern emerging from the darkness beneath my fingers, I just couldn’t bear the excitement. This was truly a different, breath-taking experience in my solitary studio. I decided to go ahead and post a snapshot of my setting before packing my materials and heading back to the house. I still have school work to do, and wonder right now if I will “do the right thing” as pertains to my job, or indulge a little more in these studio experiences. I have missed them so. Shortly after I rose from bed this morning, I checked my phone for emails and found my “artist daily” message (http://www.artistdaily.com/) discussing the possibilities of erasure drawings with charcoal. I had read in the past about Willem de Kooning’s erasure drawings, but I had never tried that technique for myself. Thinking over my recent desire to create a large watercolor still life composition emphasizing a dimly-lit interior replete with shadows, I decided immediately that I needed to give this a try. I have found it very difficult to paint dark compositions in watercolor, the paper surface is so bright, and I am a stickler for working in the transparent medium of watercolor. I knew I needed to find my way to the shadows. T. S. Eliot’s words were stirring in my imagination. Coming home from school, I entered my newly-reconstituted garage/mancave, put on a VHS tape of Willem de Kooning, and set to work with charcoals, a kneaded eraser and an old flat brush formerly used in oil painting. 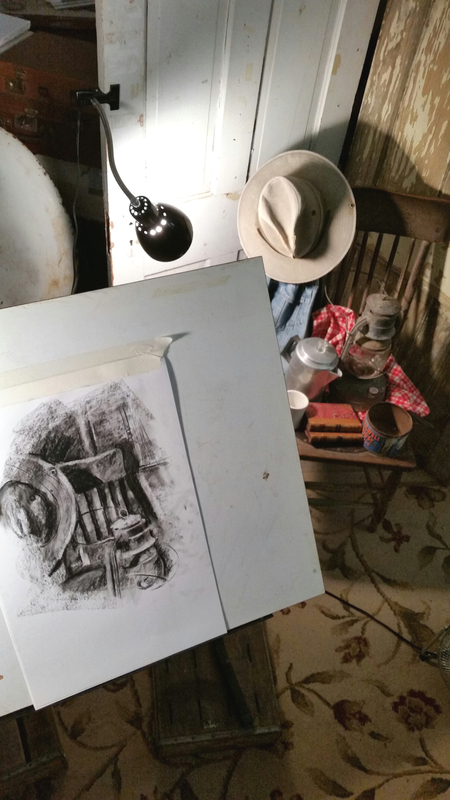 With these three tools in hand, I sketched quickly, first covering the paper surface with a dark layer of charcoal, then using the eraser and brush to highlight and mid-tone the objects. I felt an unusual delight as I watched the shapes emerge from the gloomy atmosphere, and felt a connection with greatness, knowing de Kooning had been trained in these kinds of drawing techniques while a young art student in Holland. No poet, no artist of any art, has his complete meaning alone. His significance, his appreciation is the appreciation of his relation to the dead poets and artists. You cannot value him alone; you must set him, for contrast and comparison, among the dead. I mean this as a principle of aesthetic, not merely historical, criticism. So, what is a teacher thinking as he stands at his open classroom door, watching his students file in? This morning, my mind was more active than usual, as I stood at my door, greeting my A. P. students and checking their I.D.’s. My thoughts were all over the still life I had begun assembling last night in my garage, and I was sorry to have had to abandon it today to go to work, But alas, that is how the die is cast; I’m happy and fortunate to have a job, especially one that I enjoy. And even though I was going to be speaking about ancient Rome in the minutes ahead, I kept thinking about those mute objects standing at attention this morning as I watched my garage door close and slowly backed down my driveway to head for school. Probably 85 percent of our students are the ones we forget within a year after they have departed our classrooms. We remember the top percentage of achievers with their grade totals, and we remember the bottom end with their attendant disciplinary problems and frustrating issues of barely passing or failing the course. But what about those 85 percent in between that do all that is asked of them? How are they remembered? Are they even remembered? I want to crawl into the heart and center of this still life under construction in my studio. I want to know the stillness as well as the history that infuses that collection of mute witnesses to a large segment of my past century. The assembly of objects reminds me of the heart of my student population that does what is expected of them, without fanfare, without drama, without drawing attention to themselves. The quiet ones. This night, I salute them, remember them. Tonight I am better because of what they contributed to my understanding of life. Tonight the spotlight shines on them and they cast their own shadows. If Journalism is Literature in a Hurry, then what is Blogging? As last weekend drew near, I took a short break from some busy activity and watched a portion of “Runaway Bride” on TV. I laughed out loud at Richard Gere’s line (quoted in my title). If “journalism is literature in a hurry” as he stated, then I laugh profusely, just thinking of what blogging actually is. But over the course of a two-day, twelve-hour watercolor workshop I was privileged to teach for the Trinity Arts Guild in Bedford, Texas, several affirming remarks were made about my blog, and I was embarrassed, knowing my writing habits had languished due to late nights in school preparations. So . . . I am trying to return. I find myself often idle, vagrant, stupid and hollow. This is somewhat appalling and, if I do not discipline myself with diligent care, I shall suffer severely from remorse and the sense of inferiority hereafter. All around me are industrious and will be great, I am indolent and shall be insignificant. Avert it, heaven! avert it, virtue! I need excitement. This watercolor was created, looking closely at an old door I loaded into my Jeep and hauled to the workshop. The artist pushed this one out very quickly, in fact she created at least four watercolors over a two-day period (maybe five). 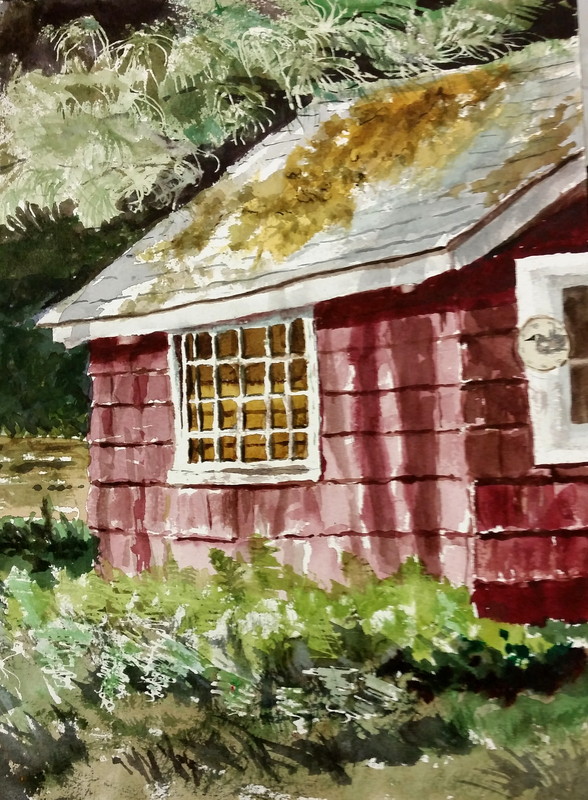 Another participant painted this watercolor on the second day, using digital photos she had taken herself of an abandoned structure. There were nine artists in this workshop, and I spent the two days walking about the studio and outdoors in a state of perpetual wonder–I was incredulous at their level of talent, and often worried about getting in the way of their creatvity rather than instructing and trying to improve them. Not only did I find them very gracious toward me and receptive to my comments; they were so wonderful to one another with their words of encouragement and sense of wonderment at the world of watercolor possibilities. As soon as I returned home late Sunday night, all I could think was getting back into the man cave/garage that I stopped using two winters ago. I have posted a photo at the beginning of this writing to show what I’ve been trying have tried to assemble for my next large-scale watercolor still life. The only problem I’ve encountered (besides time constraints with my teaching schedule) is that I have accumulated too much debris in the garage over the past two years and have found it a real trial, carving out a space large enough to paint a large subject such as this. I used to be able to bring a portable drafting table into the middle of my studio space, but that space is just not there at the time being. I’m still trying to find new ways to reconfigure it. Thanks to this fascinating workshop experience, all I want to do now is cozy up this winter and try to create some sublime still life pieces. I’ve waited far too long. Today was a grinder of a day. I taught three art history classes on ancient Greek sculpture (loving every minute of each), then returned to school late this afternoon to grade a backlog of journals and essays, dashed down the street to my favorite Cafe Acapulco for a quick Mexican dinner, then back to school to catch the final performance of Martin Theater’s Superior Donuts by Tracy Letts–a deeply-moving play set in a rundown Chicago donut shop. I was seated about ten minutes before lights out, and managed a quick, quick pencil sketch in my Moleskine journal of the set. 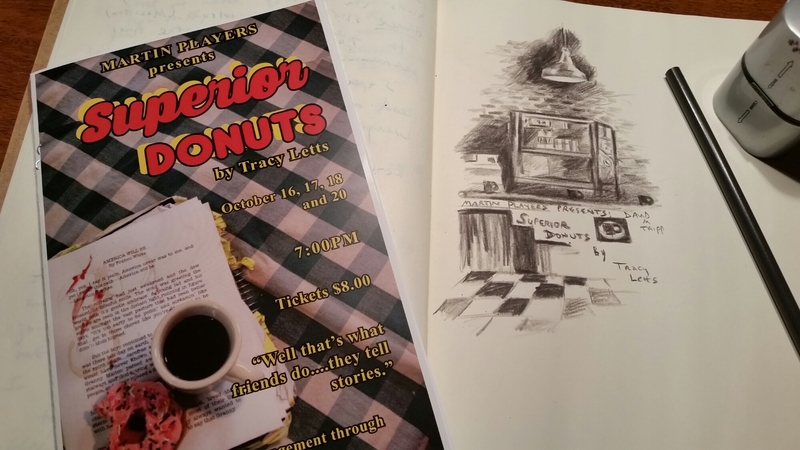 The three-hour production was deeply moving and cathartic, as all excellent plays are, and the high school cast performed masterfully. I will never forget the experience of tonight. It’s late and I need to retire for some quality sleep. But I wanted to share this moment with whomever reads, so thanks always for reading. I am inspired to return to the brush, thanks largely to tonight’s performance on the stage. This morning was a one-of-a-kind, considering I had trouble sleeping throughout the night. Before dawn, I arose, found out it was 59 degrees outside, and decided to greet the Texas morning with a brisk two-mile walk through the sleeping neighborhood. Words cannot record the delicious aspects of this encounter. Returning to my study, I pulled Thoreau’s Natural History Essays from my shelf, and read an essay I hadn’t read since I studied at Oregon State University in the summer of 1992. Where did all that time go? Nietzsche always told his readers never to trust thoughts that were not born out in the open air, while walking about. He is right. 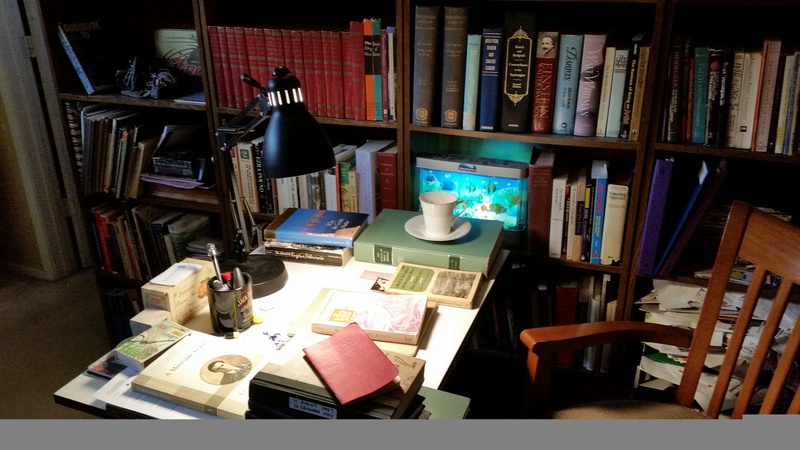 I have spent the duration of this morning in the study, writing with delight the thoughts and observations that surged through my conscious being as I sauntered across my neighborhood. More to come later . . .
My mind still second-guesses my decision to stay home on a Friday night and grade online college homework that was backing up. But I did. And I’m happy now to see an empty file on my Blackboard. What surprises me even more is that I moved from that chore to cleaning up my dwelling place, which took even longer. But now I can relax. I have my last craft show in Arlington for this year, in the morning beginning at 9:00. It is a one-day affair, and indoors. I went drove there late this afternoon and set up my booth, so all is ready. As I was reaching for a book and heading for a comfy chair, I suddently realized that this blog has lay dormant since last weekend. So, I decided to post one of my brand-new greeting cards. Years ago I created a series of collages featuring my personal intellectual heroes from the world of literature, theology and philosophy. I even put some of them on a greeting card, but never put a text on the backside, until this week. 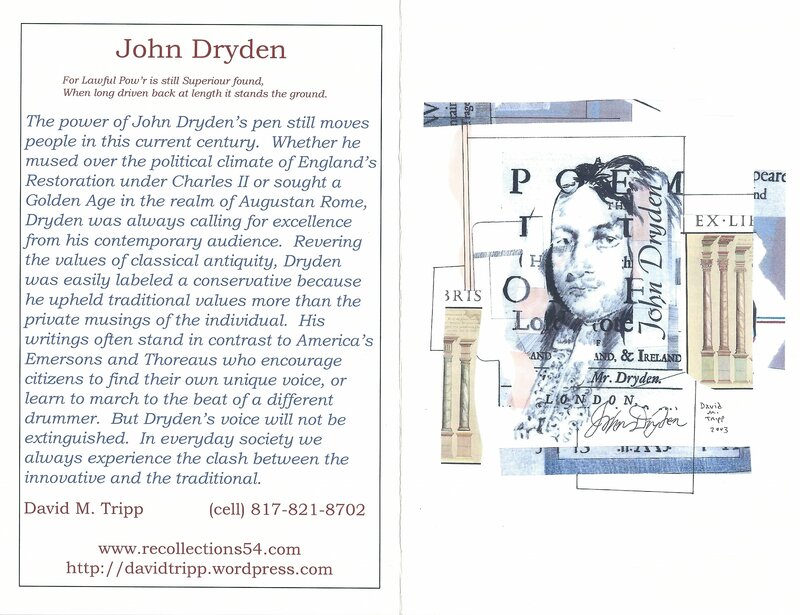 Now I have a quantity of 5 x 7″ cards (collage image as well as tribute text) featuring Dryden, Shakespeare, Locke, Berkeley, Whitman, T. S. Eliot, Burroughs, Ginsberg, Einstein, Paul Tillich and Dickens. I’ll be bringing them out into the public for the first time tomorrow at the fair. I have a number of additional collage compositions ready for greeting card format, but I’ve decided to hold them back until I put a tribute on the back of each of them as well–Proust, Kant, Hegel, Emerson, Thoreau, Melville, Tennyson and Poe. This week has been wild and woolly for me, but not interesting enough to post details. Suffice it to say that high school and college kept my plate full every day and every night, and it wasn’t much fun. I read almost nothing outside my preparations for all the classes. And I graded for hours and hours. I’m just glad to have those details swept clean, to have a festival to attend tomorrow, and the rest of the week open. Whether I read, journal, paint, or do all three, remains to be seen. But I’m really happy I spent Friday night tidying up these annoying details in order to set myself free for another 48 hours or so. While seated in Murn’s Cafe in Archer City, waiting for dinner, I was reading David McCullough’s “Introduction” to the book A Writer’s Eye: Field Notes and Watercolors by Paul Horgan. While visiting with Horgan in his living room, McCullough noticed a large, beautiful topaz from India the size of a golf ball. It was a gift from Senator Moynihan. “Paul told me to put it to my eye and suddenly everything remarkable about the room was made infinitely more so, a magic multiple of images, vivid, full of surprise, and everything bathed in the gemstone’s own warm, clear light. To call the effect kaleidoscopic is not enough. The room was transformed. This metaphor left me breathless. For most of my life since graduate school, I have wanted to construct a kaleidoscopic world view from my reading, my art, my thinking, my teaching and my journaling. At my present age, I no longer feel jealousy when I read of the success of writers/artists such as Paul Horgan; instead I am fueled by inspiration from their examples. Today I marvel at the contributions of giants such as Ralph Waldo Emerson, Paul Tillich, Sigmund Freud, T. S. Eliot (I pause because I am leaving out myriads of geniuses, but you get what I mean) . . . thinkers who moved beyond the conventional wisdom and facts distributed in their classrooms and lecture halls and had the courage to synthesize from a plethora of sources–literary, theological, aesthetic, musical, etc. And the more I come in contact with the gifts of these fertile minds, the more I want to put out a few of my own. I would love to weave my own kaleidoscope, symphony, fabric or composition from disparate sources and create something attractive. Leaving the cafe, I was surprised at the thunderclaps that seemed to shake the old buildings on my block. I dashed into my hotel room, retrieved my watercolor supplies, and took up a seat under the awning in the front of the Spur Hotel. 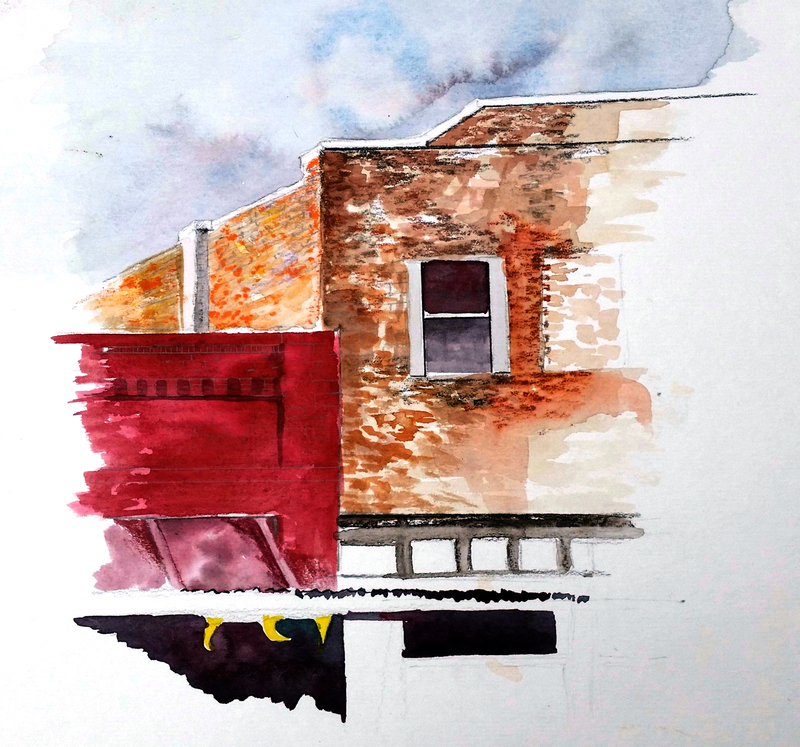 Looking out upon the darkening western horizon, I chose to do a quick watercolor sketch of the antique store and cafe across the street where I had just conducted my morning business. After about an hour, I decided to quit, because the winds were getting cold, though the temperatures were only in the low-sixties. My short-sleeved Tshirt was not getting it done for me. Bundling up with additional layers from my room, I next decided to walk along Highway 79 and follow up on an abandoned gas station that I painted over a year ago. 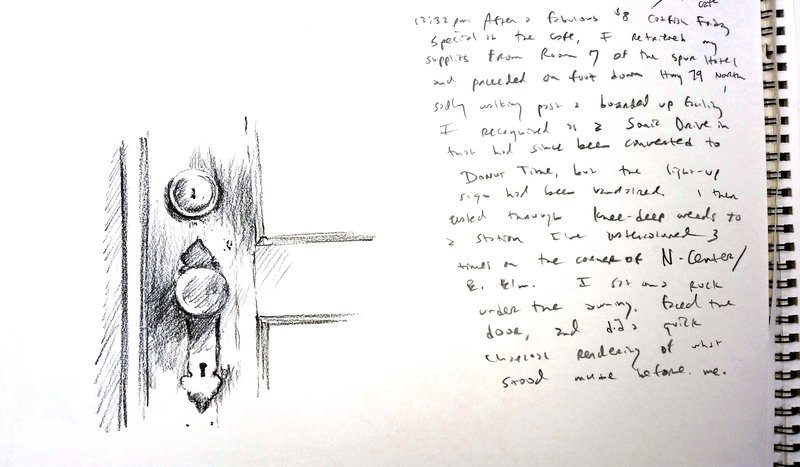 I found the front door still intact, and was in the mood to work with charcoal and sketchbook. I found a large rock under the awning, about ten freet from the front entrance, so I assumed a comfortable sitting position and worked quickly on this subject. I still kick myself that I do not sketch enough, on site or otherwise. I just don’t sketch. I always go directly to watercolor, which to me is a terrible way to paint. I draw so much inspiration from the sketchbooks of the likes of Edward Hopper, J. M. W. Turner, Eugene Delacroix, Andrew Wyeth, and continually chafe at myself for being too lazy to pursue that kind of disciplined compositional study. 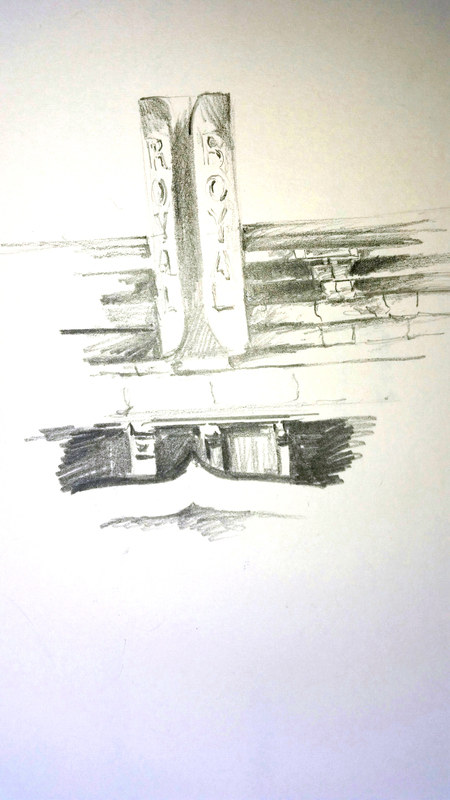 After my bout with this filling station door, I then walked back to the square and began a sketch of the facade of the Royal Theater, used in Larry McMurtry’s “Last Picture Show.” The rain aborted this attempt, but at least I got a start on it and took plenty of reference photos in the event that I return to the subject. The day proved to be a pleasant one, and I was ready to return to my room and read for awhile (and work on the lantern watercolor sketch). Inspired by David McCullough’s “kaleidoscope” metaphor I thought I would look for ways to capture my surrounding world in images and words, thus preserving the memories I wish to hold. 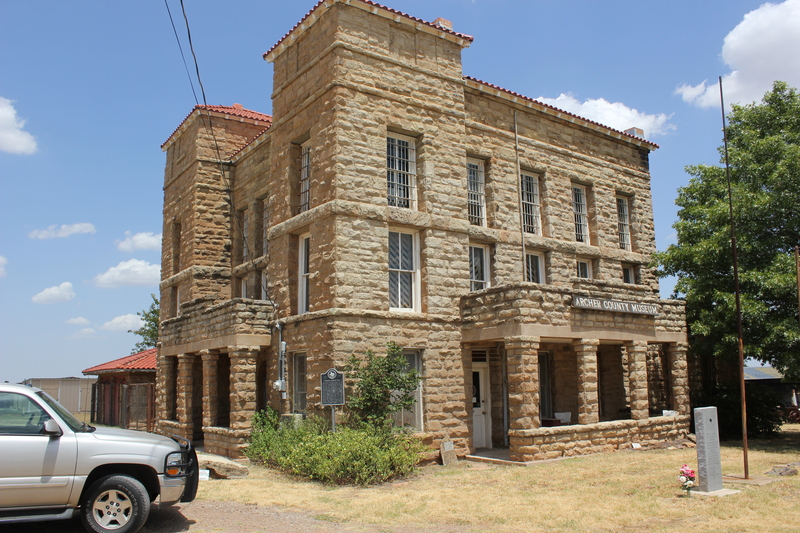 As our public schools transitioned into a three-day holiday weekend, I chose to begin mine early by trekking to Archer City, Texas, leaving the bustle and the clatter of the city in my rearview mirror. Seven weeks of high school and university teaching had rendered me tired and in need of a change of pace. 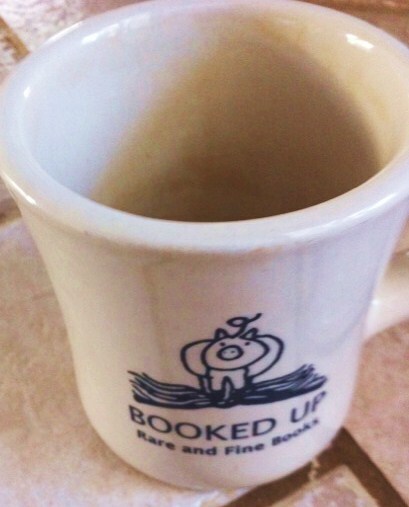 Long stretches of time had passed since I last nestled into the town of Larry McMurtry’s “Last Picture Show” and his iconic Booked Up Inc. (over a hundred thousand quality used books in his store). 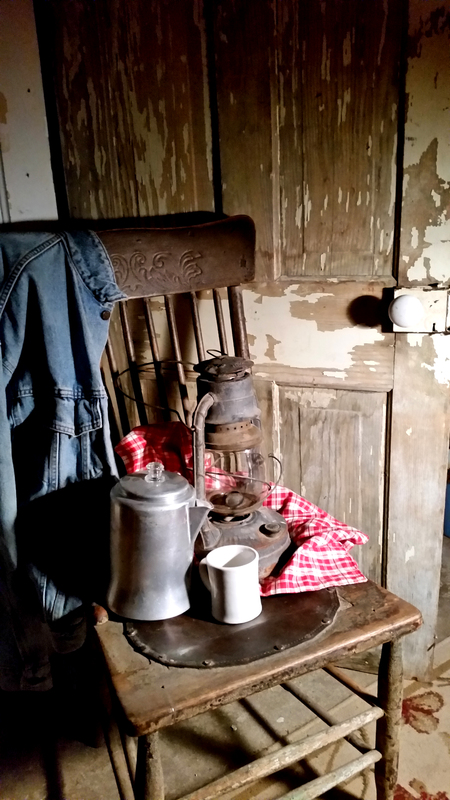 After climbing three flights of stairs and dropping my luggage inside Room 7 of the historic Spur Hotel, I wandered across the desolate Main Street (Highway 79) and into Cobwebs, an antique store I have enjoyed shopping over the past decade. It only took a moment, drifting through that dimly-lit store with more smell of the musty past than light from the present, that phantoms of memory emerged from the gloom, and I was “home” again. The real seasoning of life for me may be found in those Proustian moments of recognition of episodes long buried in my childhood past. 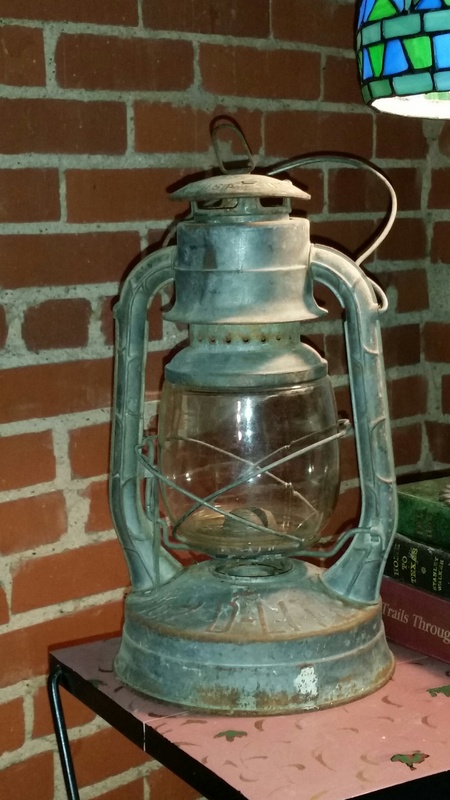 Moving past vintage plates, coffee mugs, and tools, I continued to peruse those mute occupants of the shop, until I found something I could not push away—a $12 lantern covered in dust and grime, with its globe still intact. Winter is not far away, and still life painting is my passion during those long dark months in my garage studio. I made the purchase and hurried to my room across the street to get busy sketching and watercoloring this iconic object from my past. 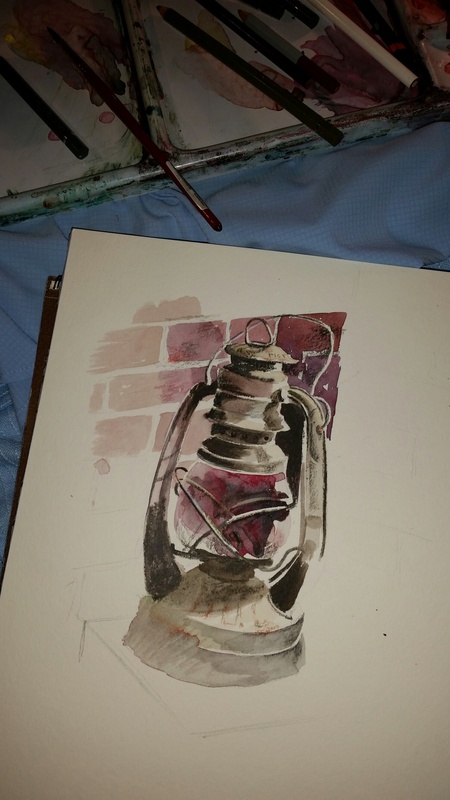 As the chilly weather descended on Archer City and the overcast skies remained dark, I cozied myself in my rented chamber and set to work sketching the lantern in the corner. Allowing myself stretch breaks for walking about the desolate town, perusing the used book store, and reading in the quiet of my room, I would return to this lantern at night, finally succumbing to drowsiness a little after 9:00. At 5:00 a.m., I awoke with a runny nose (ragweed season has arrived in the Texas country). Outside it was raining hard and 53 degrees, and I could not return to sleep, thanks to eight hours’ rest accompanied by the excitement to return to the lantern waiting silently in the dark corner. 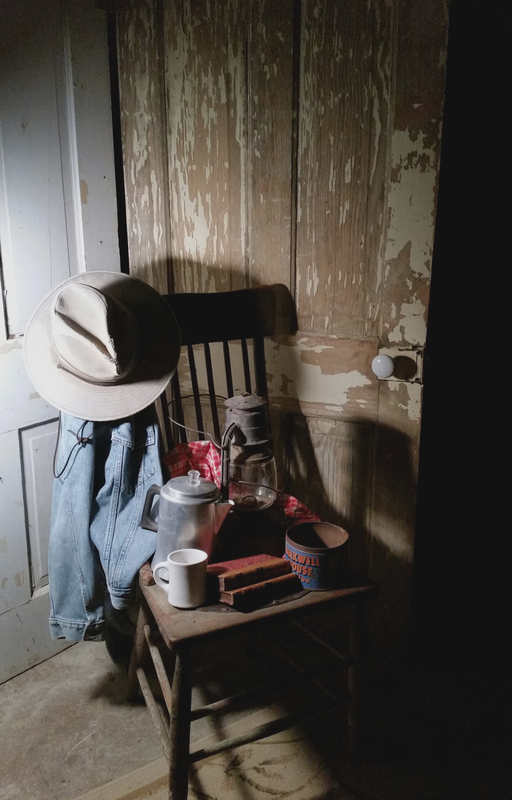 I adjusted the bedside antique lamp to throw light on the lantern, and then arranged a small desk lamp on my makeshift drafting table, leaving the rest of the room in darkness and quiet, save for the rain on the windows. 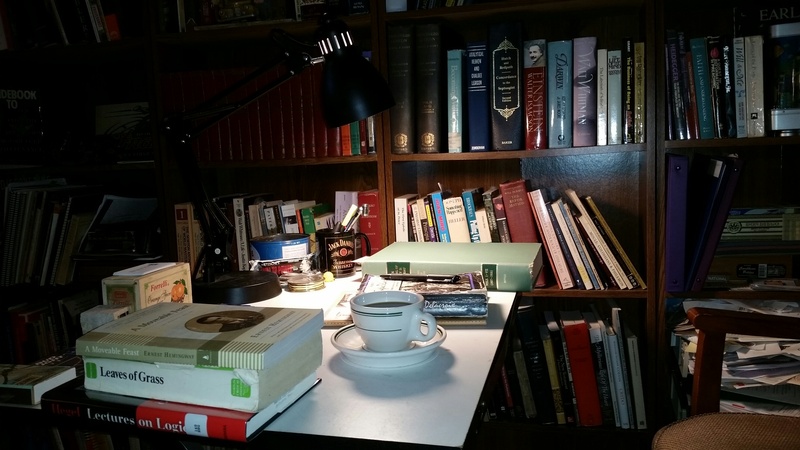 I will always be grateful that my seminary days provided me the opportunity to study the Greek language, and following those years, I have expanded my explorations beyond the New Testament and Septuagint texts to those of Homer, the Presocratics and the Classical Age. In a later post, I’ll probably write of my Presocratic “morning after” as I alternated my time between the lantern watercolor and Presocratic reading. Eidolon is Greek for phantom, often translated in the Bible as “idol.” Walt Whitman, a serious student of words, kept a “Notebook on Words,” and developed this eidólon theme to express that ancient Platonic sense of eidólon as an image of our own imagination, behind which lies an ultimate reality, eternal and changeless. In our world everything changes and is ephemeral, but our sense of imagination tries to seize onto that changeless and spiritual reality lying behind all these shifting images. In Critias, Plato wrote of the eidólopoiía, the painter who forms images to point us to that underlying reality: the substance of an artist’s mood or savan’s studies long—(Whitman again). I often refer to myself as a “painter of memories,” because I paint only the images that evoke memories worth remembering. I have generally shunned popular images that may tickle the fancies of the masses, but do nothing for my own imagination. The themes of light and darkness have profoundly moved me since the years before I could read, and still do. Hence, the lantern, with memories of my grandmother’s farm house that relied on coal oil lanterns and heaters in the dark winters, those all-night campouts and fishing trips when we graduated to Coleman lanterns, and that winter of 1986 when I lived in a house that was over a hundred years old, and though it had electricity, I endured a brutally cold and dark winter, and chose to gather up several lanterns to light the interior with those antique lamps instead of flipping on light switches to power up those boring incandescent ceiling fixtures from the 1950s that were in every room.